Our boreholes are built to last. With our trailer mounted rigs and 4 x 4 tractor we can drill inaccessible sites. We have the capacity to drill soft and collapsing holes and steel case holes. We do out of town work. 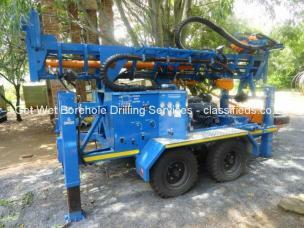 Borehole rehabilitation (flushing and relining). We arrange siting by independent professional siters with many years of experience. We do capacity testing, applications to the water authority, water testing, camera inspections and all installation work. We charge for casing actually used. Our boreholes are properly cased, developed and back filled.